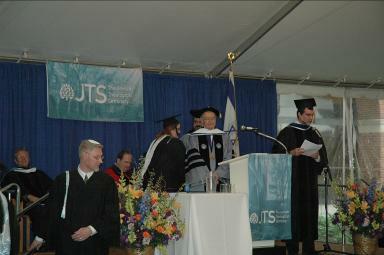 On May 18th, 2006 we attended commencement at JTS where I received my Master’s in Jewish Studies. It was a bit strange being there both because I was only on campus summers and didn’t know very many people and because I haven’t taken any classes since last summer so it seemed a bit disconnected from the process. That said, once we started processing toward the waiting crowd, excitement set in. The ceremony was nice and I got to share the stage with Amos Oz who received an Honorary Doctorate. The night before there was a dinner for the Graduate School graduates and that was smaller and more intimate. My advisor said nice things about me and we were given “parting gifts”! Almost as exciting as graduation was getting to spend 5 days in New York with Steve and my Dad and Ginger. We did a ton of walking—7 miles one day—and saw great sights. The highlight though was seeing Spamalot. It was absolutely hysterical. I have not laughed so long and so hard in ages. Click to see more photos of graduation or New York. That’s me with Chancellor Schorsch, Dean Garfinkle and Amos on the far left. 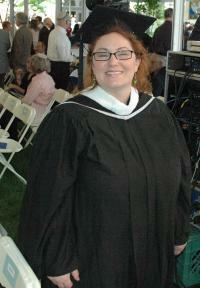 Nance graduates from The Jewish Theological Seminary! !